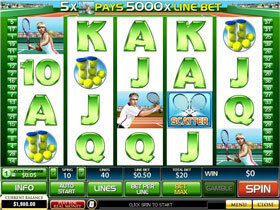 This slot from Playtech will definitely keep players interested and excited with 5 reels and 40 pay lines. 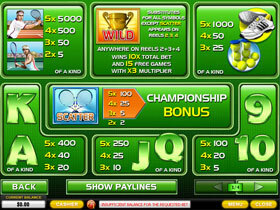 The game presents wilds scatters free spins multipliers and an excellent bonus game. The Trophy is the Wild Symbol and as per usual it substitutes for all other symbols except the Scatter. If you are able to spin the Wild on reels 2, 3 and 4 you are generously rewarded with a prize of 10 times your total wager. 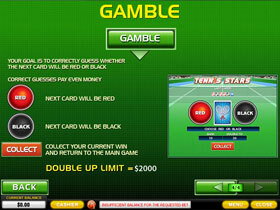 You also get 15 free games and winning on the Free Spins will multiply your wager X3. The free spins can be repeated when you spin the Wild again on the winning reels. The Scatter symbol is represented by the Tennis Rackets. An excellent feature when looking at the Scatter rewards is that payouts are made against the total value of your wager compared to the normal pay out of only on your line value. Payouts will start when you spin 2 Scatters anywhere on the reels however by spinning one more Scatter you are eligible to play in the Bonus Championship Round. In the Bonus round you move to a second screen and you then engage in a tennis match. You can play either a Ladies match or a Men's match and you must select either a Flat serve or a Slice serve. The game proceeds as a normal tennis match and the player gets points by winning a serve. The more serves you win the better your score and your prize is calculated on the points difference of your game. All very exciting remembering for every serve you win your multiplier increases. Want to bet on real tennis matches? Have a read through our article on Underdog Tennis Players to see how you can maximise your ROI. Playtech have also included a gamble feature where you can double your money by guessing the correct colour of the next card. Make a wrong call and you lose.